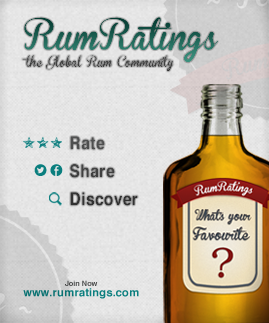 RumRatings, an online community where members can rate, share and discover rum, has started with a bang by collecting more than 500 ratings since officially launching 1 January, 2013. With 1000+ rums from 70 countries that members can add to their personal cabinet, RumRatings has built a haven for enthusiasts who seek an international rum selection and real-life feedback. A recent collaboration with El Dorado rum will surely spur more excitement. In addition to earning badges such as “Captain of the 7 Seas,” each RumRatings member now receives a 15-year El Dorado mini bottle for rating 15 rums. By incorporating design features that fit all screen sizes, many ratings have been submitted while on-the-go through tablets and smartphones. Future development plans include leader boards, rum discussions, social logins, and a mobile app. Visit www.rumratings.com today and create your own personal rum cabinet. RumRatings is an online rum community where members can create a personal rum cabinet, share stories of rum adventure, and discover new favourite rums. WIth a “RumBase” of 1000+ rums from 70 countries and hundreds of member ratings, RumRatings is quickly becoming a global resource for all things rum. The Rumratings online rum community can be found at www.rumratings.com.